Recently I read a newspaper article by an old man (nearly aged 70) about how ‘parents these days’ are basically stupid, screwing up their kids and doing a disservice to the country by raising ‘entitled’ children. I’ve read other stuff like this before. Perhaps you have too - all about how ‘kids these days’ and ‘parents these days’ have got it all wrong. Maybe you’ve read about technology, or how we’re bubble-wrapping our children, or how we’re raising entitled children (or are entitled ourselves). Sometimes these articles raise good points and sometimes, they infuriate me. Yep, this particular article was in the latter category. It's not that the advice was necessarily wrong, I'm not making a judgement on that, it's that the way it was delivered was judgemental, thoughtless and offensive. So to deal with this, I’ve written an open letter to address this article and the myriad of articles like it. Yes, this letter is for you, that wasn’t a mistake. I know you don’t consider yourself entitled, but that aside, I’m sure you’d agree someone writing an article telling others how to do something he's never done before and demanding respect, is actually acting a little entitled? That’s exactly what you’ve been doing. You've never been a modern parent, and you've never raised kids in this generation, yet you expect us to respect your opinions on these topics. Funny, that sounds exactly like the sort of ‘entitled’ attitude you want to stamp out of people like me (the parents of today, or my generation). This letter is for you, and others your age, who just want to sit back and criticise and judge modern day parents. The first problem with your 'parents these days' attitude is that if you actually knew anything about parents these days, the first thing you'd note is how different we all are. We have so many different choices and opportunities, life looks so different for all of us. There is no way 'all parents of this millennium' would answer any question the same - except perhaps that we all love our kids or that we're all doing our best. When it comes to parenting styles though... things are not so black and white these days. Do you really think our entire generation is parenting exactly the same? Do you even realise the age differences between everyone who has young kids at this time in history? There are fifteen-year-olds and forty-year-olds. Any article (or opinion) about 'all parents these days' has already undermined its own credibility. There is a popular myth out there at the moment, that my generation is entitled (convenient that it is your generation handing out the labels, don't you think?). This myth is perpetuated by the fact that the people spreading it are all of your generation. Well it’s time we had a say too. The truth is, your generation is the most entitled generation on the planet. Mmmhmm. Let’s look at some evidence. You expect to be respected based on your age, not your experience or credentials. What makes you a parenting expert? What makes you well positioned to give advice to a mother who was born in a different time period to you, and raising children in a different time period to you? Surely you see how your advice might be irrelevant or ignorant? Aside from that, no amount of credentials or experience qualifies you to be rude and condescending to someone. You want the best of things for yourself, and not for younger generations. You feel you’ve earned the right to enjoy life, and material things, but younger people haven’t. In other words, you’re entitled to benefits. But you didn't invent the technology you use every day any more than we did. You want to be able to enjoy things you didn't create yourself (opportunities, freedoms, material things) but you don't think others should be able to, just because they are younger than you. You are envious. Perhaps you don’t want us to have an easy life because you didn’t have one. I'm sorry life wasn't so 'easy' for you, but does that mean others have to have the same experience, just to make you feel better? Maybe your attitude isn’t about what kids are getting these days, it’s about what you didn’t get. You raised us. It's a tad ironic really, blaming us for how we’ve been raised. We didn't raise ourselves to be entitled. So where did it come from then? Evidently, either from your generation, or your generation's children (who you raised) who in turn, raised us. Pointing the finger and not taking responsibility is definitely something ‘entitled’ people do. You value things differently. You get annoyed that kids these days have so many opportunities and so much technology at their fingertips. That’s because you value those things differently. Our generation can say the same things about yours, just referring to different objects. The things you complain about having as a child are some of the things many of us these days could say you’re ungrateful for and would love to have ourselves. You value things you had to work hard for, but we haven't worked hard for them - of course we won't value them as much as you. Yet we will have to work extremely hard to have some of the things you took for granted as a child or parent, and we'll value those things more than you ever did too. It’s unintelligent to generalise. Admittedly, I’ve done it here for your benefit (since we need to talk in the same terms), but obviously not all people in your generation are the same (my grandmother, for one, is an amazing lady, and I know plenty of people your age who have lots of wisdom to share). We learned about prejudices in primary school (in fact, my generation is statistically the most educated generation ever). So, can you admit the same? Or are all young people or parents these days doing the wrong thing? It’s just your opinion. There’s nothing to say a kid is entitled besides an opinion. And sorry, but your opinion is not necessarily right. If you were to say your opinion was most certainly right, well, that would really just prove the point that you are entitled too. So, now that's out of the way, let's move on. First of all, the young couple you were referring to in your article, did not ask for your advice nor did they sound like they needed advice. I hope you can see that not everyone wants your advice. You have no idea, and cannot relate, to what it is like being a parent these days. Side note - it’s actually statistically probable that you didn’t have much to do with raising your own children at all either - being a domineering white man of your generation. You say family used to be centred around the parents, but the truth is, families and homes used to be centred around the ‘man of the house’. You didn’t keep your kids from sleeping in your bed because you cared about your marriage, you did it because it suited your own preferences. You didn’t have regular dinner time for the benefit of the family, you did it because you wanted your wife to have a hot meal ready for you when you got home from work. Family didn’t revolve around the adults, Mr Entitled, it always revolved around You. No wonder you miss it. 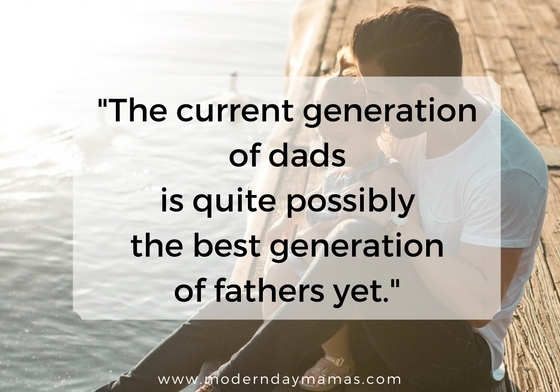 If you want to see what truly incredible fathers look like, stop pointing at yourself and look to the current generation of new dads. They are quite possibly the best generation of fathers yet. Back onto point. Your presumptuous advice comes across as judgemental and condescending, not helpful or encouraging. Which just proves even more, you want to talk about how much better your generation was, not actually help these young parents. We can tell from your article those parents love their children and put so much into raising their kids well, so why should they listen to some ignorant, intrusive and insulting outsider opinion? Now this is where you’re probably going to jump to the attack, saying, ‘your generation doesn’t accept advice because you think you know everything’ or something along those lines. That is so not the case. These days, mums are reading, listening and talking to people more than ever before. We have so many rules, judgements and expectations put on us, including from people like you. We are trying so hard to do what’s right and best for our families, and we are constantly looking for things that will help. We welcome your help and support, but we don’t want your criticism. There’s a huge difference between the two. You’re not an expert. You didn’t raise your kids perfectly, no one does. If you’re going to point the finger, maybe have a look in the mirror first. I'm sure you'd be the first to admit you made mistakes as a parent - it's part of the job - and often the only way to know what works and what doesn't work is through hindsight. Since you did things differently, you really can't say what our kids will turn out like. Who’s to say that young couple’s kids aren’t going to grow into amazing adults? Just because they have opportunities and their parents spend a lot of time with them doesn’t mean they’re going to turn out bad. What a stupid assumption. Furthermore, it's all well and good to say what you'd do these days, but you never had to actually do it. You made choices as parents from what options were available to you then; which are very different to the choices we're faced with making today. You didn't not give your kids a billion opportunities because you were wiser than us, but because you never had the chance to do so. It's easy to say what we'd do from the sidelines, but when we're in the arena, we always react a little differently. We all do the best we can, as parents, whether we're 70 or 17. Our kids are going to be some of the brightest, most loving people to have ever walked this planet. Why is your opinion the ultimate judgement on how good or bad our kids are? We're the ones who know them best, and we think they are absolutely incredible little human beings. Well, firstly, if you want to see change, change yourself first, Mr Entitled. Secondly, your generation is dying. Surely you realise the generations of people inheriting ‘your’ country should have a bigger say in the country’s future than you. We have a much bigger interest in seeing our kids raised well than you do. Maybe you should see if your kids think you (and the rest of your generation) actually were good parents first. Trust me, your generation were not the greatest parents. I know, because your kids were our parents, and our parents have plenty of negative things to say about you. After all, they never want to do ‘x, y or z’ like their parents did. Maybe the reason your generation’s children (our parents) raised us to be ‘entitled’ and the ‘centre of attention and family life’ was because they were overcompensating for the neglect they felt as children. The funny thing is, the only people I saw who liked or shared your article were people of your generation, not your children's generation. That’s saying something. The definition of wisdom is ‘the quality of having experience, knowledge and good judgement’. Age does not make you wise. In fact, if I think about the most immature, racist, sexist, bigoted, selfish people I know, there are plenty from your generation. You would hope that people your age would have accumulated good judgement, knowledge and experience over their lifetime, and many do, but it’s just not something that happens automatically. Despite popular belief, not all old people share wisdom with young people, and many young people are actually quite wise. And if we’re talking education, well, sorry, but the statistics show that Millennials are the most educated generation ever (yet). No one likes to admit people younger than them might be smarter. It hurts our egos. And when you’re shouting your opinion from a pedestal, you no doubt have a proportionate-sized ego to match. I know, your generation thinks being in the newspaper is a big deal. Um, how to break this to you… it’s not. Anyone can be in the newspaper. Anyone can put their opinion out there for the world to see these days, it doesn’t make your opinion any more valuable. Maybe that’s why our generation won’t worship your words just because they’ve been thrown onto our front lawn. These days we know our opinions aren't more valuable or important than the person's next door, and we could all publish our opinions if we wanted to. So when someone like you whines about how much better your generation was in the paper, it just comes across as a arrogant and little childish. If you really want to help, you could try listening to young couples and offering support, not belittling them in local newspapers. Parents these days face so many challenges which parents before us never had. Of course, parents have always had challenges, but those challenges do differ from generation to generation. The world we live in and are raising our kids in is so different to the world our grandparents were in. Our lives are almost incomparable. On top of that, so many of us are struggling to do the best we can. We really do intend to do the best by our kids, and so many of us are struggling to juggle everything and figure out what’s right. Many of us do this while also managing illnesses like anxiety and depression. So to be given such hurtful advice, to be told we are doing an awful job when we are doing our absolute best... I wonder if you ever considered that maybe your words did far more harm than good. Maybe you’d have been better off keeping your words to yourself, even if they were at all accurate. Just because you have an opinion, doesn’t mean you need to share it. Perhaps you feel strongly about the sort of life we should be living. Perhaps how you had it was best. The thing is, the world has changed, whether for the better or not. We cannot raise our children the same as you did, because the world is different. There are child-kidnappers and online bullies. There are health and safety standards (which are saving many babies’ lives compared to in your day). There are education requirements. There is a whole new type of peer pressure. Just because you did something well or enjoyed something as a child/parent, doesn't mean we can't enjoy different things, or do a good job by being different. We don't have to have the same experience. Maybe we are missing out on things your generation had, but we have other great benefits your generation didn't have. So, maybe your advice could be helpful, but the way you forced it on us, and the way you presented it, were poorly done. Forgive us for not worshipping your opinion, but we’ve got way too much else to do in our day. Perhaps next time you could try asking those young parents what they would like to know, or what they struggle with these days. Hey, you might find someone actually listens and you don’t have to go and write an article to whine to your fellow oldies about ‘kids these days’. It’s time to stop pointing the finger and telling young people how bad we are and what a terrible job we’re doing. We’ve had enough. We are doing the best we can, and we would love your wisdom, support and encouragement, not your criticism and judgement. There is so much we can learn from mamas and parents who’ve gone before us. Some of the best, timeless advice can come from our grandparents, and from those much older, and wiser, than us. No matter where it comes from, we can learn from helpful and encouraging advice. But that’s just the point. Next time you read some article by an older person telling you what you’re doing wrong as a parent, tell them where to shove it. I know we can learn from anyone, but if their words aren’t encouraging or helpful, and if the spirit behind their words is really about gratifying themselves and ‘their generation’, then we don’t have to listen. There is so much good stuff out there, we don’t have to waste our time on the negative crap that adds no value to our lives. I hope this article gives you confidence to say ‘enough’ when it’s needed, and to know that no matter what labels we as a generation are given, no matter what they say is good or bad, we get to choose what is best and right for our families and our futures. Just as they did when they were parents. It’s our turn now.